The DNA series currently consists of three premium products. The DNA of Revival, The DNA of Ministry and The DNA of Spiritual Gifts. These are multi-media products available for immediate viewing. Each package contains MP4 videos, MP3 audios, PPT presentation and PDF ebook. 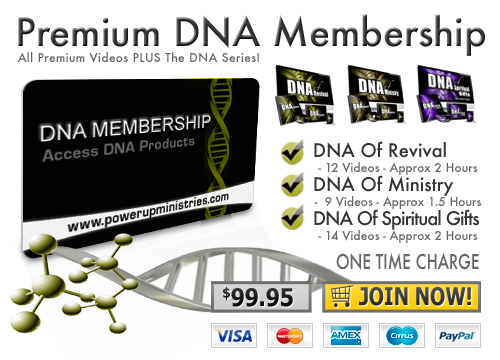 The videos are part of the DNA Premium Membership, you may purchase the EBook, MP3 audios and downloadable MP4 videos separately. This is a lifetime access memberhsip. You only pay once for access to all the material available here on PowerUP.